Product #21112 | SKU R8 | 0.0 (no ratings yet) Thanks for your rating! 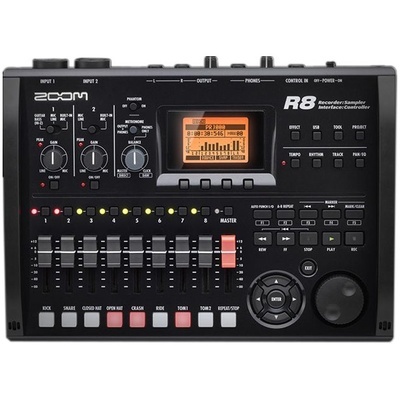 The R8 8-Track Digital Recorder/Interface/Controller/Sampler from Zoom is an ultra-portable music production solution, ideal for the musician on the go. The R8 packs the versatility of the larger R24 into a fresh compact design. Not only is the R8 an 8-track recorder that writes to SD flash memory cards, it's also a USB audio interface, a controller, and a pad sampler! Other features of the R8 include a pad sampler with 8 voices, as well as a loop-based audio sequencer for music creation. A 2GB SD card with 500MB of pre-loaded drum loops from Big Fish Audio is included so you can start creating your own unique drum creations immediately. The R8 can operate on 4 standard AA batteries, USB bus power, or the included AC adapter for excellent versatility. There are 500 internal drum loops, as well as a 2GB SD card that's pre-loaded with 500 additional loops from Big Fish Audio is included so you can start creating your own unique drum creations immediately.